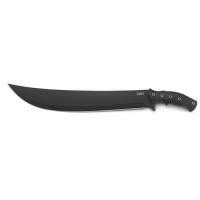 The Columbia River K916KKP CHANCEINHELL 16" Machete makes other survival knives look like toys. Its massive, curved blade provides extreme chopping power for hacking brush or breaking trails. Its black powder coat reduces wear on the steel, and the plain edge is easy to resharpen. The handle is shaped for an ergonomic grip with a large finger guard and comfortable molded finger groove, allowing you to handle the knife easily. Its polypropylene core is overmolded with textured thermoplastic rubber for a secure, non-slip grip. It also features multiple lanyard holes, opening up a wide range of carrying options. The machete comes with its own reinforced nylon sheath with a polypropylene insert for enhanced shape retention. Its Velcro belt loop system and paracord fob make it easy to carry on a belt or lash to a pack.